As someone who is constantly on the go I am always looking for the newest and best tech gadget to bring along with me. I work full time, do social media work part time, sometimes travel to conferences, volunteer on two committees and have a family. And somewhere in all of that I sleep too. I always have a smartphone and tablet with me where ever I go. Both need to have a long battery life and be suited for the type of work that I do. Today’s review is about the HP Pro Slate 8 Tablet which I received about two weeks ago and how it is fitting in to my work and personal life. The key to my hectic life style is being extremely organized and that is where I really heavily on technology. Without it I wouldn’t be nearly as productive as I am now and I would probably be wandering around wondering what I have due when, missing appointments and deadlines. I have adopted a mobile lifestyle which helps me with my work – life flow. How does the HP Pro Slate 8 fit into all of this? Simple – overall it is a great business tablet, has a long battery life and has a ton of extra features which I love and it keeps me going all day. The HP Pro Slate 8 has a nice and sleek metallic design. The rim is metal and has a nice shiny bezel. The back is made out of a smooth plastic that has a matt gray finish to it. It feels sturdy and well built when you hold it. It weighs 350 grams and it is 8mm thick. I can hold the tablet comfortably in my hand for long periods without a problem. 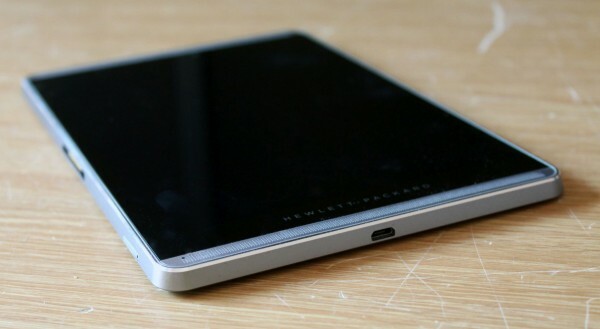 The micro-USB port for charging the HP Pro Slate 8 tablet is located along the bottom edge of the tablet. There is a docking point connector on the left hand side and the headphone jack is located at the top. The power and volume controls are on the right hand side towards the top. The HP Pro Slate 8 has a 7.8″ screen with a resolution of 2048 x 1536. This is the exact same resolution as an iPad mini. It also has Corning® Gorilla® Glass 3 and an anti-smudge coating. The display is beautiful to look at and everything looks very sharp and crisp…whether I am reading an email, a book, watching a movie or putting together a business presentation. The screen is bright enough that you can even see it in bright sunlight (which is great when I am using it on the commuter bus and the sun is glaring in through the windows). It is perfect for work and play. The HP Pro Slate has a pair of front facing speakers. The sound quality is quite good on this tablet. I have used it to stream music at work and even at an event and it does not sound tinny like some devices do. The sound has good treble and sounds high end. There is not a lot of bass but the sound is definitely impressive for a tablet. The HP Pro Slate 8 comes with Qualcomm Snapdragon 800 processors, and runs on Android Lollipop with 2GB RAM. I like Android Lollipop as it is currently running on my other devices too. I love the features of Google Now and how everything sinks across all my devices. It also has 32 GB of storage and a microSD slot for to add an additional 32 GB. Perfect for all the work documents that I save and use daily. HP has augmented the Android OS with its own office-friendly additions too. The tablet’s docking settings handle USB, audio, HDMI and Bluetooth connections, and the Duet Pen (which I will discuss in more detail later on) can be configured to interact with the screen without actually touching the panel which is pretty neat. For business use, having a secure tablet is important to me and HP delivers on this front. The Pro Slate 8 offers secure-boot and data-encryption tools which sit alongside HP’s local and remote-management interfaces. ARM TrustZone adds another layer of security to the tablet. 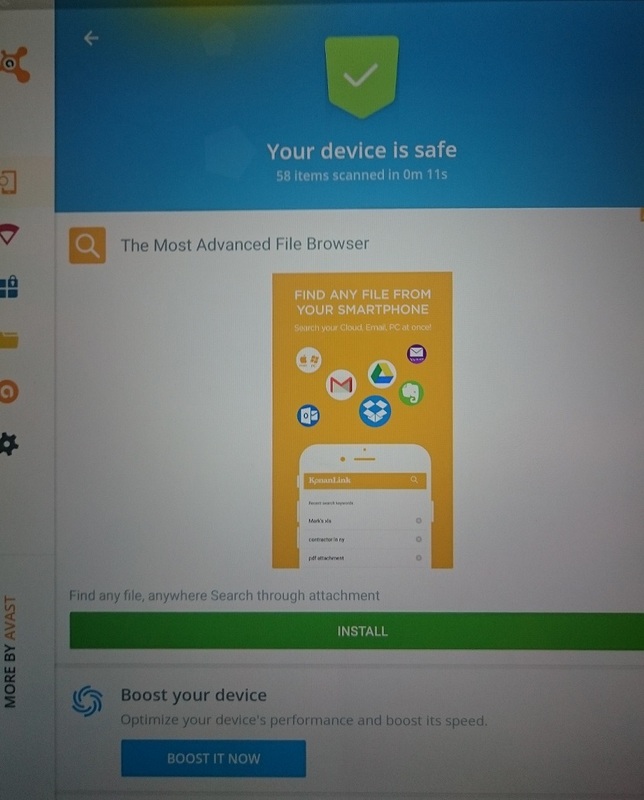 Avast Mobile Security comes pre-installed on the Pro Slate 8 as well. I did an Avast scan – can see the results in the picture below. With all the malware and spyware out there it is a great little extra to have built in. The Pro Slate 8 does not have a lot of third-party apps (or bloatware) which I also like. There’s Evernote, Corel Painter Mobile, KeyVPN and WPS Office, and the aforementioned Avast security suite – and that’s it. I find the Pro Slat 8 to be fast and very responsive for my daily use. It doesn’t slow down or lag. It’s great for meetings, emails, social media use, designing presentations and for watching movies when I have down time. I find that the battery life on the HP Pro Slate 8 to be more than sufficient. I can get through a complete day of use without needing to charge it. I use the Pro Slate 8 for email, calendar, social media apps, browsing and searching, blogging, taking notes, presentations, and for some entertainment (music and movies). On days where I was not using the tablet heavily I could easily go two days without charging it. That is great when travelling and using it at conferences. The HP Pro Slate 8 comes with a 8 MP rear camera. For a tablet that is not too bad. It takes colorful, sharp photos outside. The 2 MP front-facing camera is fine for Skype and for other types of video calls. 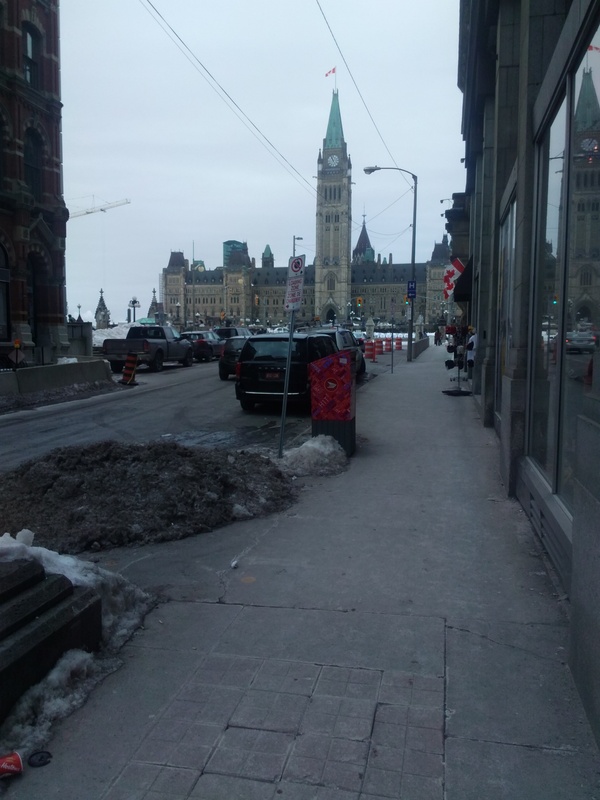 Parliament, Ottawa taken with the HP Pro Slate 8 on an overcast day. This is a fun feature that has great business applications to it. I have used a stylus before with previous tablets but it does not compares to this nifty little gadget. 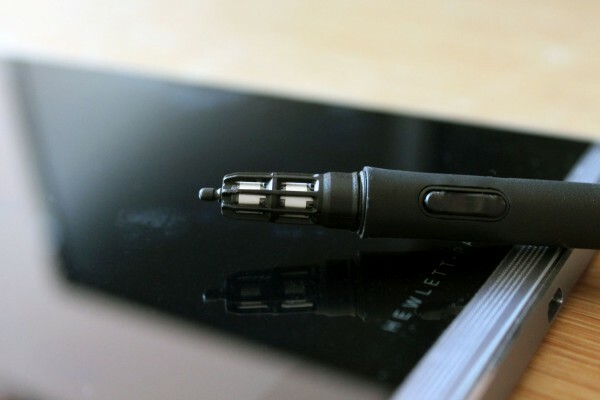 The Duet Pen has a cool tip that you can remove to switch it from a stylus side to a pen side for writing on paper. It connects to your tablet via Bluetooth. The Duet Pen does need to be charged via micro-USB but I have only had to charge the Duet Pen once since receiving the tablet two weeks ago. When using the stylus tip you can write directly on the screen and even use it for drawing with Corel Painter which is a lot of fun. 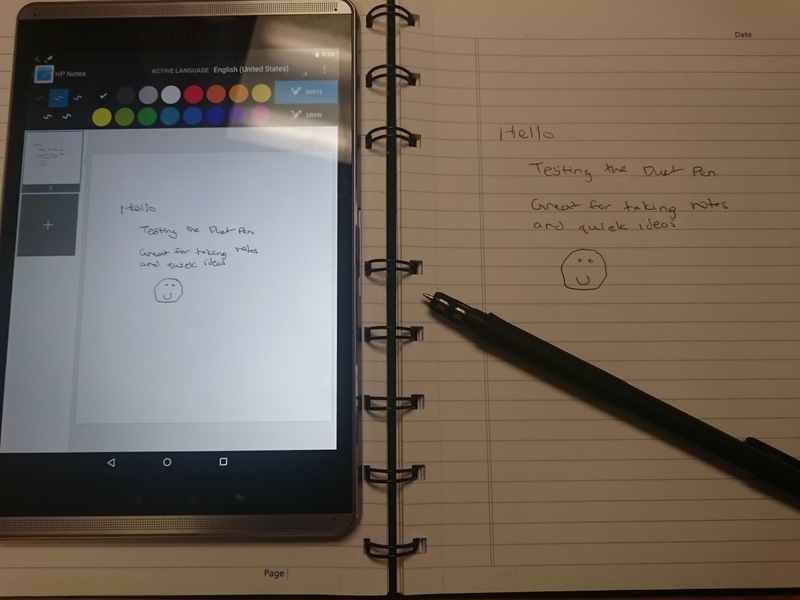 If you switch over to the pen tip you can write on paper and have the pen display what you have written on the screen with the use of the Slate Pro 8’s note taking app. 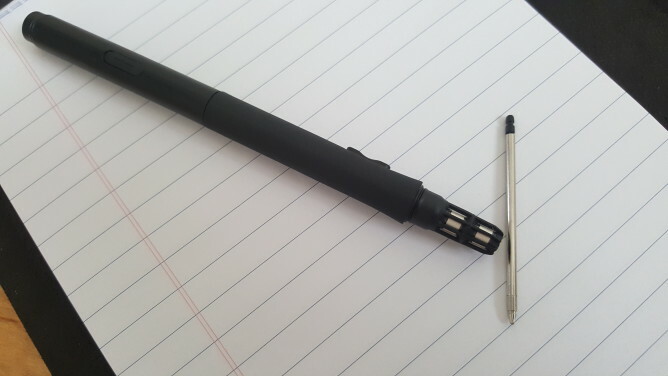 The Duet Pen transmits the movements to the tablet using ultrasonic sound, which the device picks up with five microphones it has dedicated for that purpose. I used a regular notepad and it does take a little getting used to. The paper needs to sit adjacent to the docking port for it to work. So for right handed people, like myself, you need to turn the tablet upside down. You can see below how it looks. I can see this coming in handy during collaboration sessions and meetings. 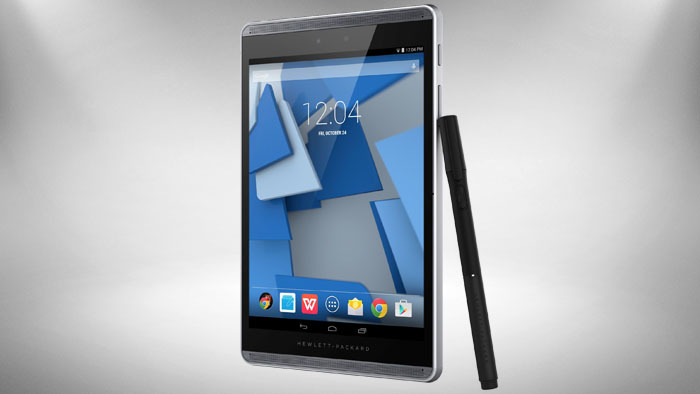 Overall the HP Pro Slate 8 Tablet is a great for business use and personal use too. It is well built with great data protection. It is great for travelling and everyday use. It has been helping to keep me productive and I am enjoying the Duet Pen. 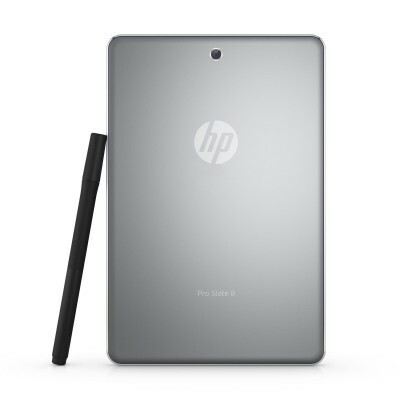 If you are looking for a well designed business tablet, the HP Pro Slate 8 is a great choice! So awesome to be able to use a device to see how you like it before buying. I think I will look for this item when I shop for a new device in the next month or so.